Consumers and health professionals are advised that Sanofi, in consultation with the TGA, is recalling one batch of Betamin tablets (thiamine hydrochloride 100 mg) due to the potential that some bottles may contain at least one Plavix/Iscover (clopidogrel 75 mg) tablet. The affected batch number is 124E001 with an expiry date of 02/18. Sanofi has advised that this issue does not affect any other batches. Thiamine hydrochloride is a type of vitamin B and is used to treat vitamin deficiency. 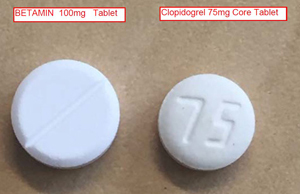 Clopidogrel is used to prevent blood clots in patients with certain heart and blood vessel disorders. 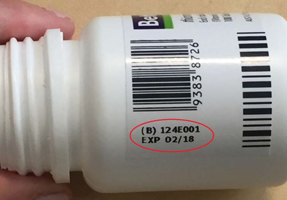 A bottle of Betamin with the location of the batch number and expiry date outlined in red. The front faces of each type of tablet. The back faces of each type of tablet. 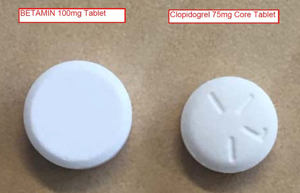 If a clopidogrel tablet is accidentally consumed there is a low risk of increased bleeding and/or other adverse interactions in patients who are already prescribed with clopidogrel or other medicines that affect blood clotting. If you or someone you care for takes Betamin 100 mg tablets, check the product packaging for the batch number and expiry date. If you have Betamin tablets from batch number 124E001 (expiry 02/18) do not take them. Return them to the place of purchase for a refund or a replacement. If you have any questions or concerns about this issue, speak to your health professional or call Sanofi on 1800 818 806. Sanofi has written to all pharmacies providing further information about this issue, including details of the recall procedure. Pharmacies should check their stock and quarantine any from batch number 124E001 (expiry 02/18) and follow the recall procedure. 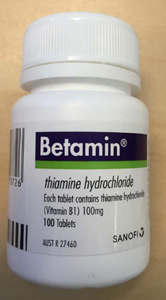 If you are treating patients who are taking Betamin 100 mg tablets, advise them of this issue. If you have any questions or concerns about this issue, contact Sanofi on 1800 818 806. If you have any questions regarding returning stock or affected batch details please call the Sanofi Product Recall Line on 1800 152 416.